The 180° power-off approach is executed by gliding with the power off from a given point on a downwind leg to a preselected landing spot. [Figure 8-27] It is an extension of the principles involved in the 90° power-off approach just described. The objective is to further develop judgment in estimating distances and glide ratios, in that the airplane is flown without power from a higher altitude and through a 90° turn to reach the base-leg position at a proper altitude for executing the 90° approach. The 180° power-off approach requires more planning and judgment than the 90° power-off approach. 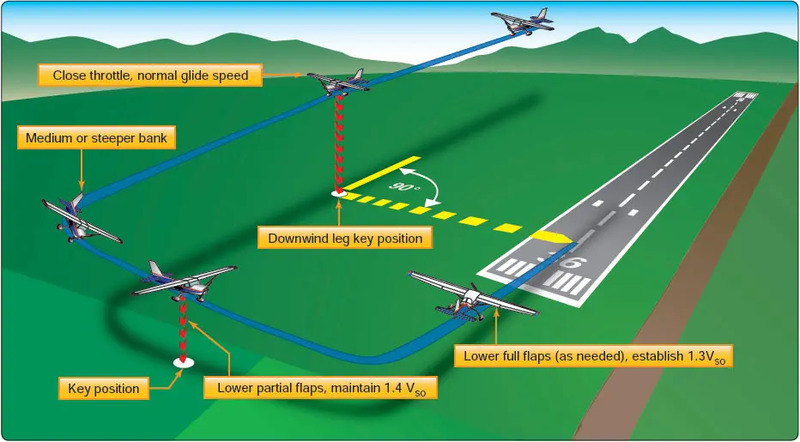 In the execution of 180° power-off approaches, the airplane is flown on a downwind heading parallel to the landing runway. The altitude from which this type of approach is started varies with the type of airplane, but should usually not exceed 1,000 feet above the ground, except with large airplanes. Greater accuracy in judgment and maneuvering is required at higher altitudes. When abreast of or opposite the desired landing spot, the throttle is closed and altitude maintained while decelerating to the manufacturer’s recommended glide speed or 1.4 VSO. The point at which the throttle is closed is the downwind key position. The turn from the downwind leg to the base leg is a uniform turn with a medium or slightly steeper bank. The degree of bank and amount of this initial turn depend upon the glide angle of the airplane and the velocity of the wind. Again, the base leg is positioned as needed for the altitude or wind condition. Position the base leg to conserve or dissipate altitude so as to reach the desired landing spot. The turn onto the base leg is made at an altitude high enough and close enough to permit the airplane to glide to what would normally be the base key position in a 90° power-off approach. Although the key position is important, it must not be overemphasized nor considered as a fixed point on the ground. Many inexperienced pilots may gain a conception of it as a particular landmark, such as a tree, crossroad, or other visual reference, to be reached at a certain altitude. This misconception leaves the pilot at a total loss any time such objects are not present. Both altitude and geographical location should be varied as much as is practical to eliminate any such misconceptions. After reaching the base key position, the approach and landing are the same as in the 90° power-off approach. The 360° power-off approach is one in which the airplane glides through a 360° change of direction to the preselected landing spot. The entire pattern is designed to be circular, but the turn may be shallow, steepened, or discontinued at any point to adjust the accuracy of the flightpath. The 360° approach is started from a position over the approach end of the landing runway or slightly to the side of it, with the airplane headed in the proposed landing direction and the landing gear and flaps retracted. [Figure 8-28] It is usually initiated from approximately 2,000 feet or more above the ground—where the wind may vary significantly from that at lower altitudes. This must be taken into account when maneuvering the airplane to a point from which a 90° or 180° power-off approach can be completed. 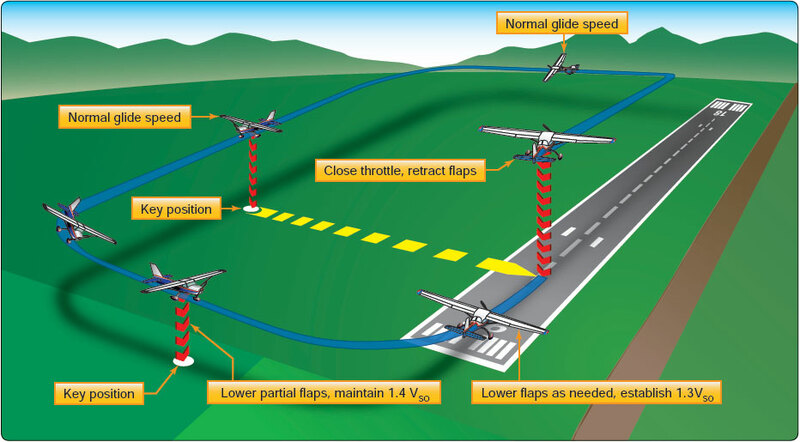 After the throttle is closed over the intended point of landing, the proper glide speed is immediately established, and a medium-banked turn made in the desired direction so as to arrive at the downwind key position opposite the intended landing spot. At or just beyond the downwind key position, the landing gear is extended if the airplane is equipped with retractable gear. The altitude at the downwind key position should be approximately 1,000 to 1,200 feet above the ground. After reaching that point, the turn is continued to arrive at a base-leg key position, at an altitude of about 800 feet above the terrain. Flaps may be used at this position, as necessary, but full flaps are not used until established on the final approach. The angle of bank is varied as needed throughout the pattern to correct for wind conditions and to align the airplane with the final approach. The turn-to-final should be completed at a minimum altitude of 300 feet above the terrain.